Who doesn’t remember what they were doing 17 years ago today as the first fragmentary reports dribbled out about one aircraft and then a second hitting the Twin Towers of the World Trade Center in New York City? I was about 75 miles from Ground Zero. Despite being able to finally make contact with friends who were working in the area after several fraught hours (one stumbled from the carnage through thick clouds of toxic smoke to safety and evacuation on the Hudson riverfront following the sounds of ferryboat horns; nearly 3,000 others there and at the Pentagon and in a farm field in southwestern Pennsylvania weren’t so lucky), it wasn’t until later in the week that we drove to the foot of the George Washington Bridge. We parked and walked to a vantage point on the New Jersey Palisades where we could see Lower Manhattan. 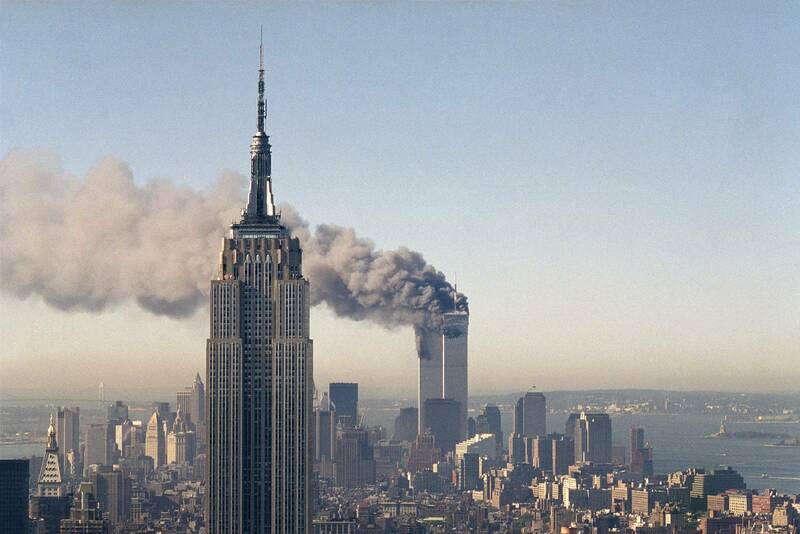 There was nothing where the towers had stood. It was only then — the sights and sounds of Air Force interceptors criss-crossing a sky empty of the usual passenger jets heading to and from metro airports were deeply unsettling — that the realization of the enormity of what had happened really sunk in. A few days later, we drove out to the ancestral farm of a friend’s family in Minnesota. The roads were empty, as still were the skies. Everywhere we looked, American flags flew from overpasses, farmhouses and trailer parks. We were westbound on a turnpike in Ohio or Indiana, I don’t remember exactly where, and came abreast of a small rental car. In the front seat were two young men of Middle Eastern extraction. Both wore dark sunglasses even though they were driving away from the morning sun. They briefly glanced at us and then quickly looked away as we passed. Fear blazed in their eyes. Were these men terrorists from a sleeper cell heading for a safe house in the wake of the attacks? Or merely college students frightened by the outpouring of anger from the attacks? Should we have called the authorities to say that we’d seen suspicious looking people? I’ve often wondered since. What I do know is that 17 years on we as a nation — and certainly our political leadership — has learned nothing from the attacks in our chimeric ignorance except that the supposed defense of America’s core values in pushing back against Al Qaeda was a great opportunity to grow the national security state out of all proportion to what realistically was needed. In the process, our civil liberties have been grievously assaulted and the Military-Intelligence-Industrial Complex, notably the NSA and its army of private contractors, has swollen to such gargantuan size that it never will be reduced to something far more realistic and far less costly in dollars spent and personal freedoms betrayed. Hundreds of thousands of innocents have died and nations have been destroyed in our blood thirst to fight the wrong war in the wrong place at the wrong time in Iraq and starve the right war in Afghanistan, which has become by far the longest and most ineptly fought in our history. Then, for good measure, there was the horror of the Bush Torture Regime. Meanwhile, Al Qaeda may be stronger than ever because of wrongheaded U.S. policies, the Muslim world hates us more than ever and the Ground Zero health crisis has deepened, while the greatest cover-up in U.S. history holds firm. This is not surprising since Americans’ inability to confront and deal with its societal shortcomings, as well our abject ignorance of the Constitution and the precious rights and profound responsibilities it enshrines, is monumental. Oh, did I mention that Donald Freaking Trump is president and commander in chief?